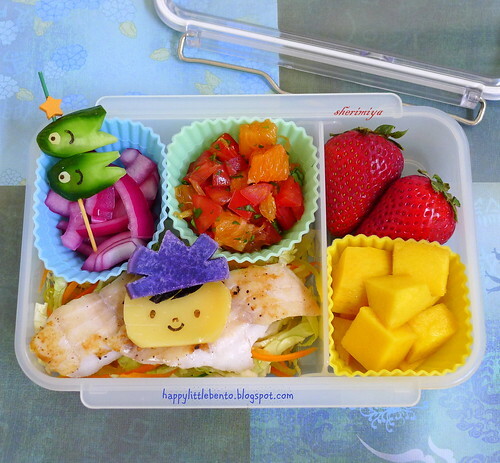 Children's Day (こどもの日 Kodomo no Hi) Fish Slaw Bento, a photo by sherimiya ♥ on Flickr. Happy Children's Day! Okay, it's not until the 5th of May, but since that falls on a Sunday, we'll be celebrating it today. I made kind of a deconstructed fish taco (but without the tortilla), which kind of falls in with Cinco de Mayo too. Yay! I pan-fried snapper and served it with a fresh cold cabbage slaw which was tossed with shredded carrots, onions, cucumbers, and rice vinegar with a sprinkling of sugar. I also made a tomato cara cara orange salsa. A cup of mango completes the tropical feel. Along the pickled red onion there are some cucumber koi nobori (carp) to go with the cheese nori boy with his Okinawan sweet potato hat. A couple of big strawberries fill out the box. I know it's "Children's Day", but when I was a kid we called it Boy's Day (and there's a Girls' Day to balance in March), and so this one is for my MisterMan. Hope he likes it! Yep, the koi is the cutest thing I've seen for a long time--awesome! I really love your bentos. They are always so colorful and appetizing.